This is a finely painted beautiful KPM Berlin Plaque of the mother and child, circa 1880 in date. The plaque depicts the Sistine Madonna and Child is titled on the reverse and is within the original antique carved and gilded frame. Add this beautiful image to any wall in your home. Condition: The plaque and the frame both in excellent condition, with only minor signs of wear commensurate with age and use, please see photos for confirmation. Dimensions in cm: Height 24 x Width 19 x Depth 3 Dimensions in inches: Height 9 inches x Width 7 inches x Depth 1 inch The Royal Porcelain Factory in Berlin German: Königliche Porzellan-Manufaktur Berlin, abbreviated as KPM, also known as the Royal Porcelain Manufactory Berlin and whose products are generally called Berlin porcelain, was founded in 1763 by King Frederick II of Prussia (known as Frederick the Great). Its actual origins, however, lie in three private enterprises which, under crown patronage, were trying to establish the production of "white gold" (i.e. porcelain) in Berlin from the mid-18th century onwards. The company logo is a cobalt blue sceptre, which is stamped painted prior to 1837 on every piece. All painted pieces produced by KPM are signed by the painter. KPM is still producing to this day; each piece of dishware and decorative porcelain is entirely unique. KPM has produced a number of dishware forms and porcelain figurines throughout its history. Some forms have hardly changed their shape in over 200 years of production. Frederick the Great, who, as the owner, jokingly referred to himself as his own "best customer", was under the spell of the Rococo style during his life; a culmination of this artistic style can be seen in his castles. To this day, the most successful designs of the 1930s are the Urbino, Urania and Arkadia (originally a tea set designed in honor of KPM's 175th anniversary) created by Trude Petri. The Arkadia medallions were created by Siegmund Schütz and the Urania set (with the same basic form as the Arkadia) did not enter production until after the war, as was also the case with the Arkadia table set. Porcelain figurines of different styles corresponding to each era have always been created under the guidance of the master workshop, including the modern animal sculptures, such as the miniature Buddy Bear or the Knut Bear. 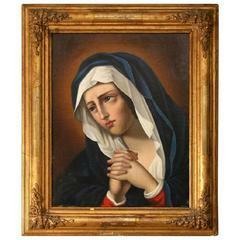 KPM Berlin oval porcelain plaque with image of Madonna, circa 1830.